The Thomas Kearns McCarthey Gallery wishes you a very happy and successful New Year filled with the best of Russian art and culture! What better way to start the new year than by participating in the Gallery's monthly no reserve silent auction! 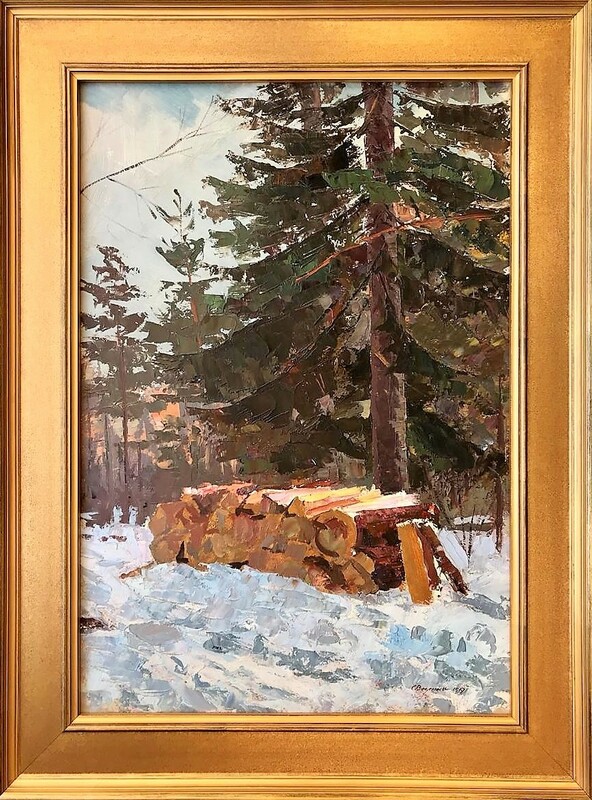 beautiful winter forest landscape, "Park Near Palanga City", by Sergei Nikolaevich Vedeneyev, estimated at $3,000- $4,000. Vedeneyev, painted "Park Near Palanga City", plein air. He woke before sunrise to capture the beauty and isolation of the forest as the first emerging rays of sunlight were cast. The painting has a fascinating composition, light and vibrant brush strokes and a striking color pallet. This combines to create a dynamic landscape painting that changes with the different times of the day and with the seasons. Sergei N. Vedeneyev, "Park near Palanga City"
We invite you to participate in this month's auction and thank everyone who placed bids in November's auction. Congratulations to K. Jenny who placed the winning bid of $3,750 for "Roses", by Alexander I. Berergovoy, estimated at $7,000- $9,000. "Park near Palanga City" is estimated at $3,000 to $4,000, the current high bid is just $1,000! The next bid is $1,250, followed by minimum bidding increments of $250. Bids will be taken via telephone, or e-mail until 7:00 pm MST, Wednesday, January 2nd. Follow all the bidding updates on the Gallery's website. Sergey Nikolayevich Vedene ev was born in the Smolenskaya Village in the Yaroslav Region on August 11, 1908. From 1935 to 1937 he studied at Art at the prestigious University of Yaroslavl under the guidance of professor S.F. Shitov. Later, from 1937 to 1940 he moved to Ivanovo where he worked and studied in the Studio of N.P. Serekin. 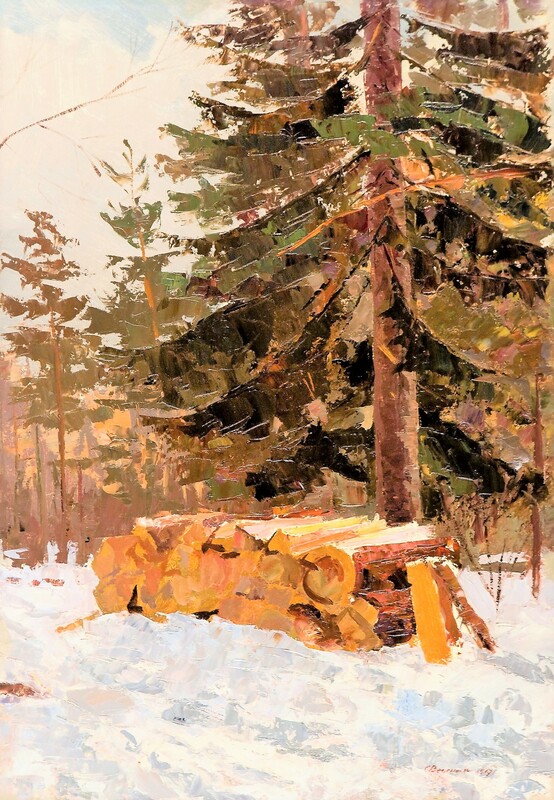 In 1946 he moved to Kostroma and began painting. From that time he actively participated in many City, Regional and Republican Art Exhibitions. Several personal exhibitions of the artist were held in his home town of Kostroma. In addition to his work as painter he also illustrated many books, including those of J. Verne and L.Panteleev for the Regional Publishing House in Kostroma. Sergey Nikolayevich Vedeneev continued the traditions of the Russian realistic Art School. He painted genre composition, portraits, landscapes. The artist's paintings can be found in museums' and private art collections in Russia and abroad. "Park near Palanga City", Framed, 23" x 30"